We were at Blind Tiger a few weeks back and saw that they had Dogfish Heads new IPA on the menu. Unfortunately when we ordered it they had just run out. So imagine my surprise when I saw a couple bottles at the Bowery Whole Foods. I always forget that place has a ton of great beers. So I picked one up and brought it home to try out. 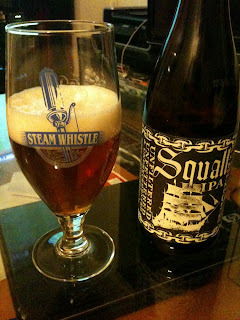 The Squall is basically their classic IPA that instead has been unfiltered and bottle conditioned. They apparently made this beer in collaboration with a clothing store not to far from the brewery. They were inspired by the clothes they made and came up with this beer as an ode to them. The beer poured a dark brown with a decent sized head on the top (the Steam Whistle Glass seemed to fit). The smell is exactly like the regular 90 minute IPA- strong and hoppy. The difference between these two beers lies in the taste. While both have that extreme malty complex flavor, the Squall seems a bit more balanced. It has a slightly sweet finish to the end that makes this a much more drinkable beer than the regular 90 minute. At 9% alcohol I definitely had a warm feeling in my tummy after a few sips. This beer is only available in a few east coast states and for a limited time. I still think the Dogfish Red and White is the best of the bunch but this one is a winner.